Texas Trash Talk: Texas Virtual School…another CSCOPE? When CSCOPE hit the news, most of the attention was focused on the lessons. Much less attention was paid to the money side of CSCOPE. But there were so many questionable practices from contracting to accounting, that the Texas State Auditor was asked to get involved. The ESCs collected $73.9 million for CSCOPE, but they couldn’t account for over $6 million of public funds. Texans, like myself, who assumed that our public education dollars were being protected by at least the minimum in standard contracting and accounting procedures. Were these practices unique to CSCOPE or was this the way ESCs operate in general? does have legislation outlining specifications. 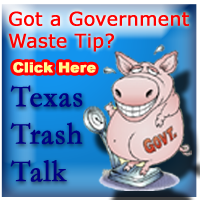 But this time, instead of just having poor contracting and accounting procedures with public funds, I have a video of a government entity explaining how they defied the Legislature and by-passed Texas law in order to operate TxVSN, and their elected officials rationalizing their actions. I don’t have enough room to print everything, so I have chosen a few highlights of my findings to share here. The Texas Legislature passed SB 1788 in 2007 establishing the Texas Virtual School Network (TxVSN) and funding the operations with state funds. Texas Education Agency (TEA) issued a Request for Proposals (RFP) entitled “Central Operations for the Texas Virtual School Network” with the deadline for submission 3/5/08. Eligible proposers were limited to the 20 Texas ESCs. According to discussions held in a public meeting on 2/26/13, The Harris County Department of Education (HCDE) wanted to bid for Central Operations of TxVSN, but was excluded by the mandates of the legislation because they are not an ESC. Esc-10's first TxVSN contract period was 4/10/2008 through 8/31/2008 for $750,000. (NOT an ESC and NOT an HUB) to provide 74.5% of the work for $559,138. The first sub-contract with HCDE covered the same dates, 4/10/2008 through 8/31/2008. But records show the work began months before the contract was formally signed. HCDE’s Board didn’t even vote to approve the contract until 2 WEEKS BEFORE IT ENDED. This sub-contract has been renewed or extended every year with the same discrepancies repeating themselves. But dates and signatures are only part of the contracting concerns. Documents show that ESC-10 did not request bids before it sub-contracted the development of TxVSN Central Operations to HCDE. Statute dictates that an ESC will operate the network and TEA awarded ESC 10 the Central Operations contract. I checked the form participating school districts need to send to TxVSN Central Operations for the mailing address. Where is the phone answered? Then I looked at the original “Scope of Work” descriptions spelled out in ESC-10’s sub-contract with HCDE, it is obvious who is actually “operating” the TxVSN. But there are two major issues with HCDE operating the TxVSN. Why would a government entity go down to the county courthouse and file documents in order to conduct business under an assumed name? Just as with CSCOPE, I end up asking a whole series of questions…. When it comes to Texas education dollars, who is watching the store? Do the ESCs and other government business enterprises like HCDE really operate unchecked? Do the Commissioner of Education, TEA and the Legislature really not know what is going on – or are they part of the problem? Could the answers to all of these questions be something as simple as… … follow the money? Is it just a coincidence that less than a year after leaving TEA, Robert Scott, the Commissioner of Education from 2007-2012, became a paid “consultant” for HCDE? Is it just a coincidence that when leaving the Legislature Rob Eissler, Chairman of the House Public Education Committee from 2007-2012, also became a paid “consultant” for HCDE ? Is it also just a coincidence that emails show when HCDE’s Superintendent warned Rob Eissler this past May that his lobbying group's $269,500 HCDE “consulting” contract may be in jeopardy, Eissler called a current member of the Texas House Public Education Committee, Rep. Dan Huberty, who then called HCDE Board President, Angie Chesnut, and the contract remained intact? I am sure, just like the HCDE name change, they are all just remarkable coincidences. With CSCOPE, the ESCs got off scott free because the Legislature left so many loopholes in the statute governing them. But with TxVSN, the Legislature dictated the funding and the operations in statute so I have personally asked the State Auditor's Office to investigate the contracting of the TxVSN. If you agree, you may contact the State Auditor's Office and urge them to investigate Texas Education Agency's TxVSN contracting with ESC-10 and HCDE @ 512-936-9500 or email.